- 30 Capsules per Bottle. These 1:1 ratio, CBD to THC Capsules are made with high-quality lab tested THC distillate, as well as premium lab-tested CBD, isolate. Both are infused in organic non-GMO cold-pressed grape seed oil and made with high-quality vegan gel caps. ( 100% BSE free no additives or preservatives. Gluten-free. Kosher and Halal certified gel caps). Capsules are made in small batches to ensure quality and accurate dosing. 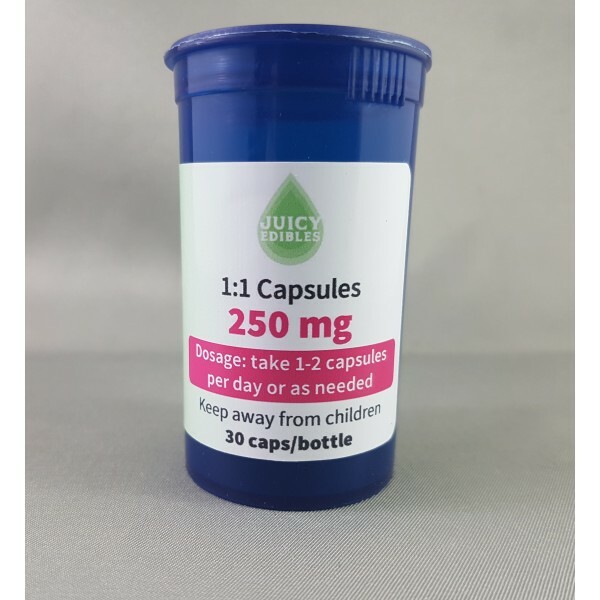 Juicy Edibles 1:1 Capsules - 4.2mg THC and 4.2mg CBD per capsule - 125mg CBD/ 125mg THC per bottle (30 Count Bottle) - 1:1 Ratio. 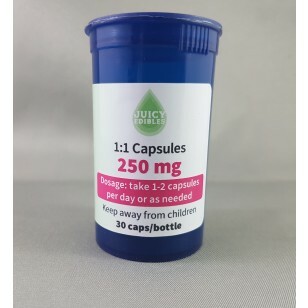 - 4.2mg THC and 4.2mg CBD per capsule - 125mg CBD and 125mg THC per bottle - 30 Capsules per Bottle. These 1:1 ratio, CBD to THC Capsules are made with high-quality lab tested THC distillate, as well as premium lab-tested CBD, isolate. Both are infused in organic non-GMO cold-pressed grape seed oil and made with high-quality vegan gel caps. ( 100% BSE free no additives or preservatives. Gluten-free. Kosher and Halal certified gel caps). Capsules are made in small batches to ensure quality and accurate dosing.